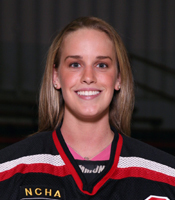 STEVENS POINT, Wis. - The Lake Forest College women’s hockey team took three of a possible four league points over the weekend (February 16-17) at UW-Stevens Point. The Foresters skated to a 1-1 tie with the Pointers Friday night and defeated the seventh-ranked team in the nation 3-1 on Saturday. Lake Forest is now 10-5-6 overall this season and 5-3-5 in Northern Collegiate Hockey Association play. Stevens Point fell to 14-6-2 overall and 6-4-2 in NCHA games. After a scoreless opening period Friday night, junior Courtney DeHoey (Chatham, Ont./Bluewater Jr. Hawks) put the visitors on the scoreboard at the 6:05 mark of the second stanza. Her 12th goal of the season was both unassisted and shorthanded. The Pointers tied the game on a power play goal at the 10:14 mark of the third and neither team was able to score again in the contest. Forester senior goaltender Sally Bevis (Huntington, N.Y./North American Hockey Academy) stopped a season-high 42 shots on goal on Friday to raise her save percentage on the year to .941, the fourth-best mark in the nation. 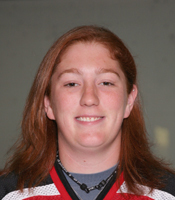 Eight days after recording Lake Forest’s first-ever victory over UW-River Falls, freshman goaltender Ryann McCarthy (Lombard, Ill./Team Illinois) gave the team its first triumph over Stevens Point as well. She recorded 34 saves while surrendering just one goal on Saturday, raising her record on the year to 7-1-2 and save percentage to .924, which ranks 11th in the country. Power play goals by junior Allison Rushing (Seattle, Wash./Seattle Admirals) and senior Katie Snowden (Toronto, Ont./Willowdale Redwings) at 14:28 in the first period and 12:14 in the second, respectively, gave Lake Forest a 2-0 lead heading into the final 20 minutes. Snowden assisted on Rushing’s sixth goal of the season. Rushing and freshman Megan Patrick (Corunna, Mich./Capital Center Pride) assisted on Snowden’s eighth. Junior Laura Wilson (Corunna, Ont./Sarnia Sting) took advantage of an empty net with 3:14 remaining in the game to make the score 3-0. Her team-high 15th goal of the year was unassisted. The Pointers pulled their goalie again and finally got on the scoreboard with 1:03 to play. Lake Forest clinched a berth in the four-team NCHA O’Brien Cup Tournament (March 2-3). The squad will first travel to UW-Superior next weekend (February 24-25) to close out the regular season.